Cats catch colds, usually caused by a virus – just as humans do. Even the symptoms of a cat cold are similar. His illness may come and go without nary a blip on your radar but some action may be required if you should notice prolonged symptoms. One of the more commonly seen culprits is the feline herpesvirus type-1 (FHV-1). It sounds scary but it doesn’t mean that you and your cat will break out in blistering sores. The symptoms are much the same as in human colds – sneezing, discharge from the mucous membranes, and inflammation of the eyes. 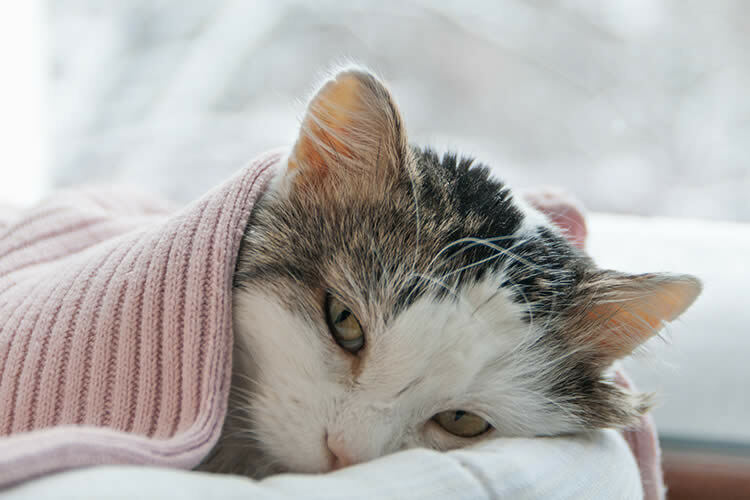 Other cat colds are caused by various virus strains – but the symptoms usually are comparable to the FHV-1. Cat viruses are passed from cat to cat and they tend to be highly contagious to other felines. In multi-cat households, sicknesses will easily spread even if you isolate the affected pets. For this reason (and many others), housecats should always stay indoors and sick cats should be separated from their mates. Keep your cat clean. Colds will cause discharge which will affect his eyes, nose, and possibly ears. Wiping away the discharge from these areas will make a difference in your cat’s comfort. If he can’t smell or see, his appetite will be severely diminished making it more difficult to keep him hydrated. His main areas need to be cleaned regularly as well. Wash and disinfect his bowls. Launder his beds and blankets, even adding some bleach to the water. Try to bathe him – warm water may help clear his sinuses. If you can’t bathe him, rub him down with warmed pet wipes. Cats love warmth so try moving his bed in the sunlight or next to a heating vent. Investing in a heated pet bed might be appropriate for the winter season. Feed your cat his favorite food and add a little water to it. There are varieties of milk made for cats – they love the taste and it will give them the hydration they need. For cats with no appetite, you can try feeding him a canned food variety loaded with extra calories and nutrients. If your cat isn’t drinking on his own, try a medicine syringe filled with water. Gently push the syringe in his mouth and empty it slowly. He will be forced to swallow the water. This method will only work on more manageable cats. It’s time to take him to the vet when he hasn’t drank any water for a day. He will need saline injected under his skin or intravenous fluids. Your vet will perform a blood test to rule out FELV and FIV and may possibly prescribe antiviral medications. Can Humans Catch a Cat Cold? Humans cannot catch viruses directly from cats or dogs. Whether cats can catch human viruses is another matter – and not entirely agreed upon by the scientific community. What is clear is that a cat is less likely to catch a cold from a human than it is from another cat. If you do have a cold, you probably shouldn’t worry too much about snuggling next to your furry feline for a little comfort. In any case, the tiny virus’ zoonotic and reverse-zoonotic (animal to human transference) behaviors still have mysteries yet to be solved. Best Health: Can Cats And Dogs Catch Colds From You?